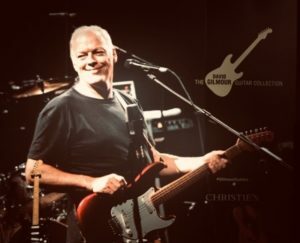 Legendary Pink Floyd’s David Gilmour’s Guitar Collection at Christie’s Auction to Benefit Charity – Art, Food, Travel and Fashion! This June, Christie’s presents The David Gilmour Guitar Collection: the personal guitar collection of the rock ‘n’ roll legend David Gilmour — guitarist, singer and songwriter of Pink Floyd. With more than 120 guitars, including his preferred Fender models of Broadcasters, Esquires, Telecasters and Stratocasters, the auction on 20 June marks a rare opportunity for guitar aficionados, musicians and collectors to explore one of the world’s most comprehensive groupings of guitars that hooked generations. In advance of the New York sale, the entire David Gilmour Collection will be exhibited at Christie’s London followed by the 10 most iconic guitars in Los Angeles and will conclude with a full preview in New York. Estimates start at $300 with proceeds to benefit charity.David Gilnour’s 1969 Black Fender Stratocaster has earned its place in rock’n’roll history. Known as ‘The Black Strat’, the guitar was purchased in 1970 at Manny’s on West 48th Street in New York, and has become the Pink Floyd singer and songwriter’s most identified instrument over the course of nearly 50 years. 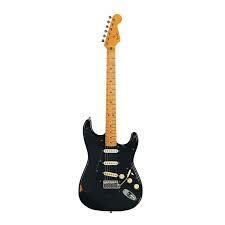 Between 1970 and 1986, The Black Strat was Gilmour’s primary performance and recording guitar, and was key to the development of the Pink Floyd sound. It was played in the recordings of landmark albums such as the 1973 masterpiece The Dark Side of the Moon, which includes the track Money and is widely regarded as one of the greatest LPs of all time; Wish You Were Here (1975), featuring the track Shine on You Crazy Diamond, which Gilmour reveals ‘came out of’ The Black Strat; Animals (1977); and The Wall (1979), which features Gilmour’s legendary guitar solo on Comfortably Numb. The Black Strat, which has been extensively modified over the decades to accommodate Gilmour’s evolving style and performance requirements, can also be heard on his critically acclaimed solo albums including David Gilmour (1978), About Face (1984), On an Island (2006) and Rattle that Lock (2015). ← Exciting results from Cannes Film Festival 2018!